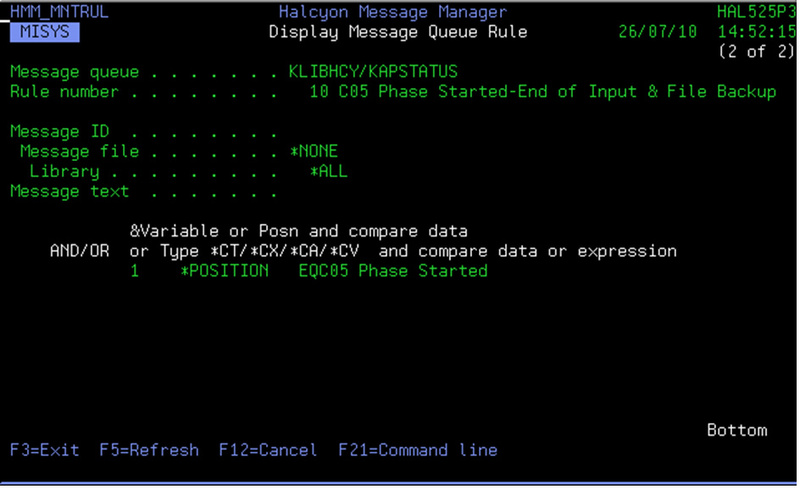 Do you have an application, key process or end of day routine running on the IBM i that writes to a message queue (or QHST) providing progress or status indicators? You’re not interested in when each phase starts but you want to be alerted if any particular phase exceeds a threshold (defined by you) or if the whole end of day process runs for an excessive period, potentially impacting the online day and other key business availability. Do you want to monitor your unattended End of Day and raise an alert if a phase exceeds an acceptable run time? 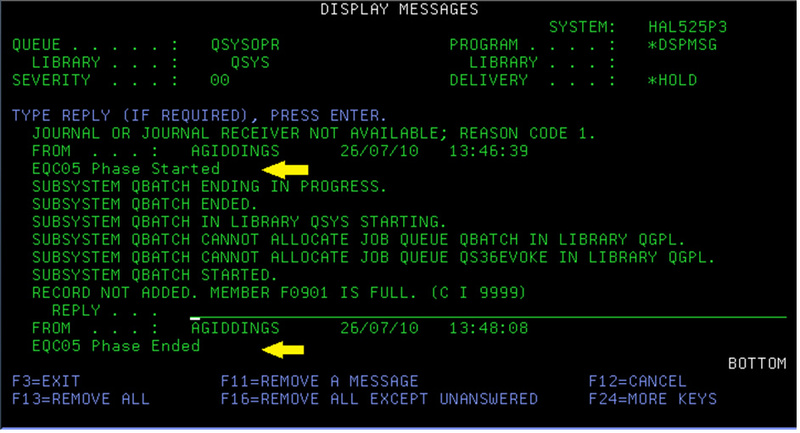 What happens if the EQC05 phase starts okay but either overruns or fails meaning that the end of phase message doesn’t appear? What is the knock on effect to the remainder of the End of Day? Will the system be available late? 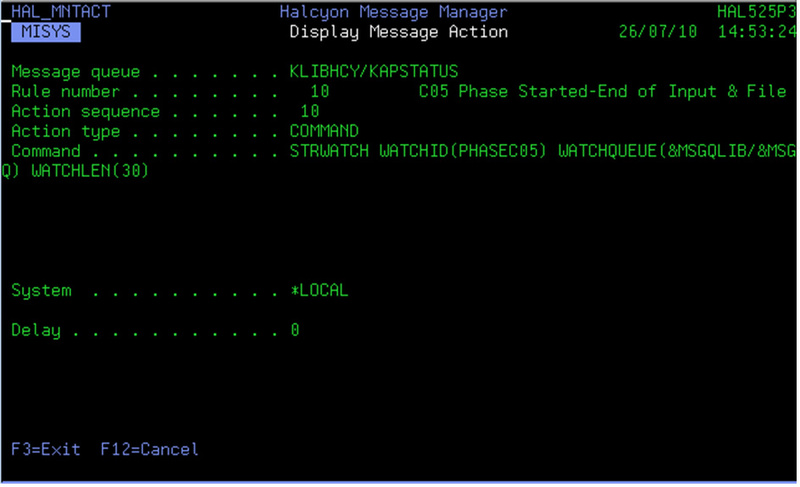 Halcyon’s Message Manager “Start Watch” facility provides the ability to monitor variable start times focusing on fixed durations. 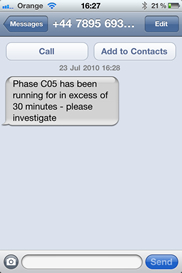 If the phase completes within an acceptable time frame no alerts will be sent out, if the phase exceeds your chosen time frame you have the ability to be notified by whichever form of communication suits you and your business (SMS, email, or visible graphical alert etc.) or your could actually run an IBM i command or program. 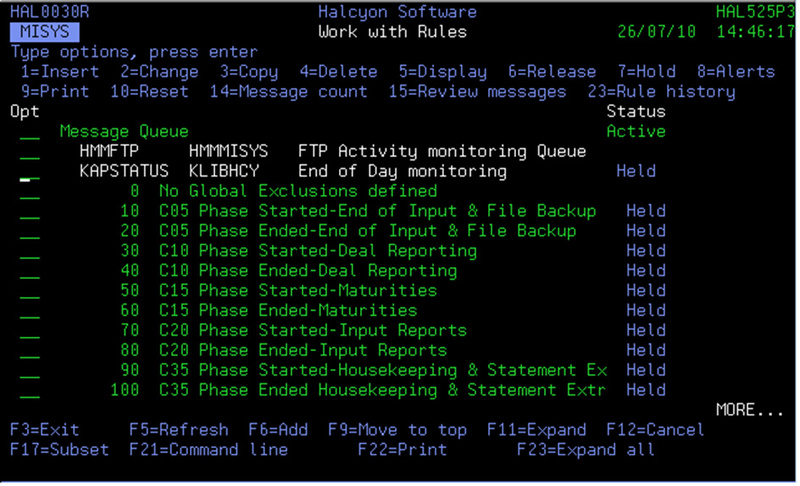 Halcyon have two simple rules defined that work as a pair that will handle the monitoring and associated customizable actions. In the screenshot below I have a number of pairs monitoring different phases of an End of Day. 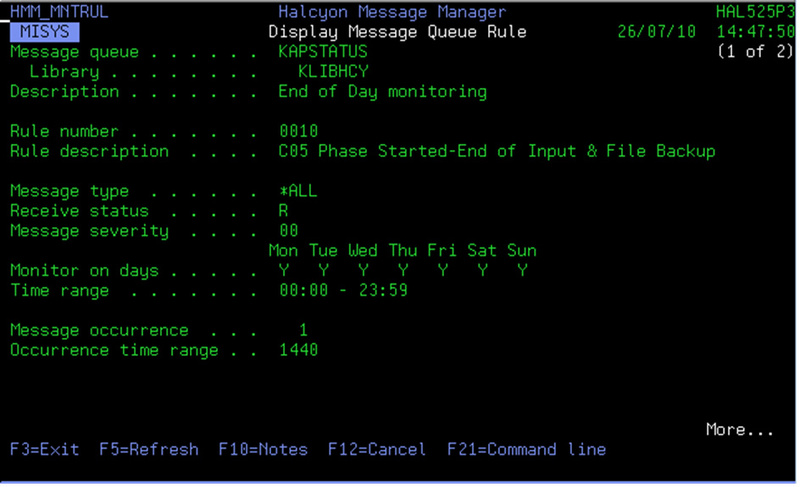 Monitoring for the phase starting text arriving on the message queue any day, any time. We’re looking for a blank message ID from the MISYSEOD job although as you can see we can be very specific or generic here if required. 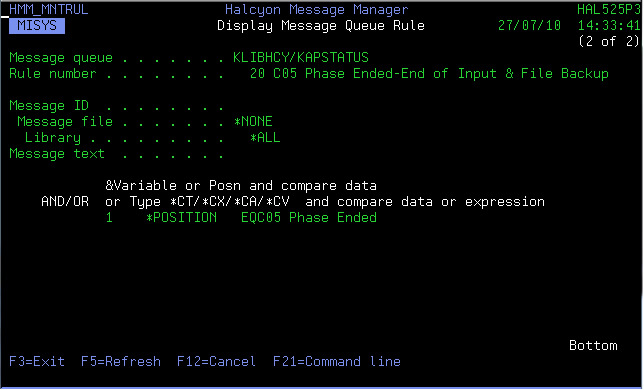 Looking for the text “EQC05 Phase Started” appearing. When the “EQC05 Phase Started” arrives on the queue the rule carries out the associated action, which in our case in the STRWATCH (Start Watch) command. This second rule gets activated by the arrival of the start of phase and is looking for the “EQC05 Phase Ended” not arriving in the next 30 minutes. 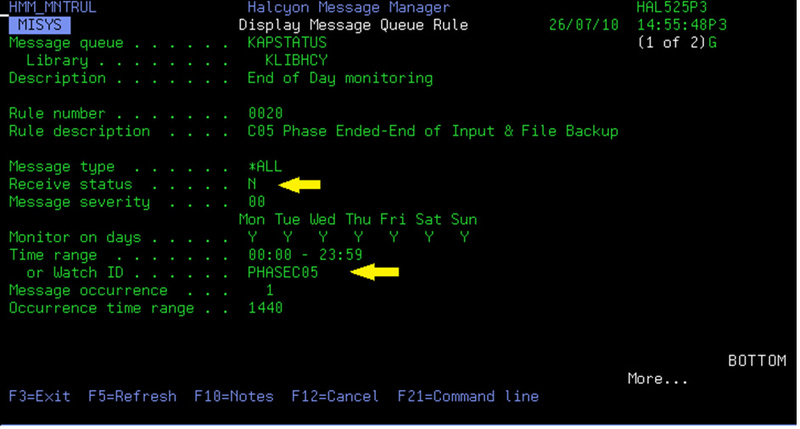 Note the receive status set to ‘N’ for not received and the Watch ID “PHASEC05” (which is the link between the pair of rules). 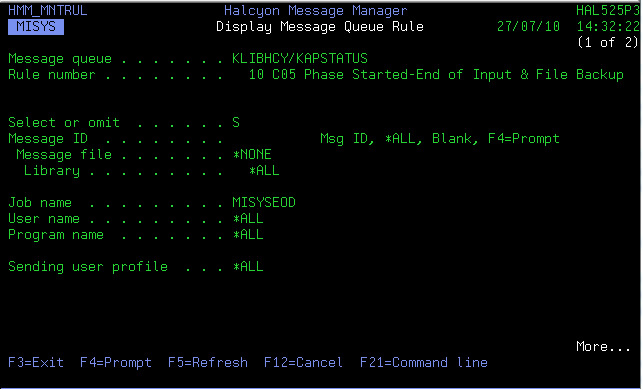 Providing the phase ended within our 30 minute threshold there will be no alarms raised but should it not within an acceptable period we can provide real time alerts in many different forms and in addition can process any IBM i command. These actions can either be keyed manually or can be consolidated into an easy to use Action Schedule. 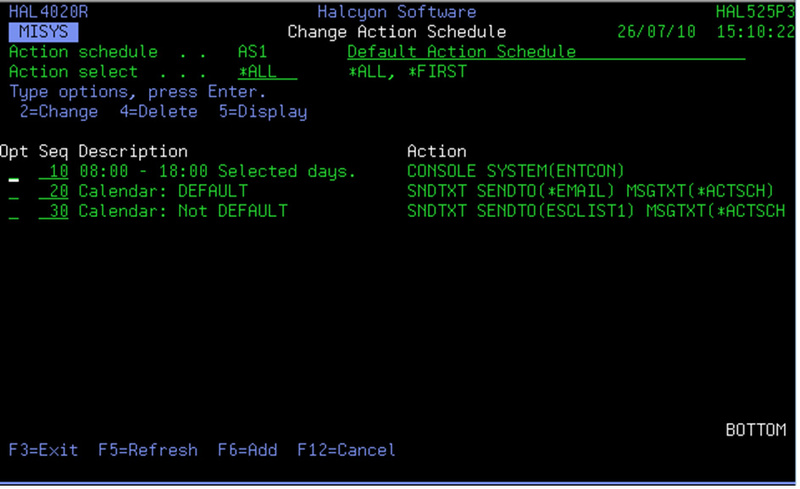 In the Action Schedule below, an Enterprise Console graphical alert is generated and an email is sent to a support team on weekdays from 0800-1800hrs. 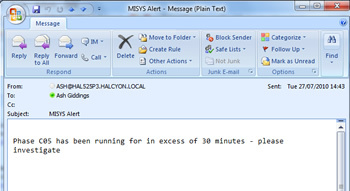 Outside of those hours an SMS is sent to an Escalation List. In addition to monitoring individual phases we can also monitor the End of Day process as a whole and define a rule that alerts if the job runs for longer than 4 hours. Once configured, the setup can quickly be deployed to other systems or LPAR’s with the use of the powerful import facility enabling extensive monitoring to be deployed across your midrange environment within minutes. 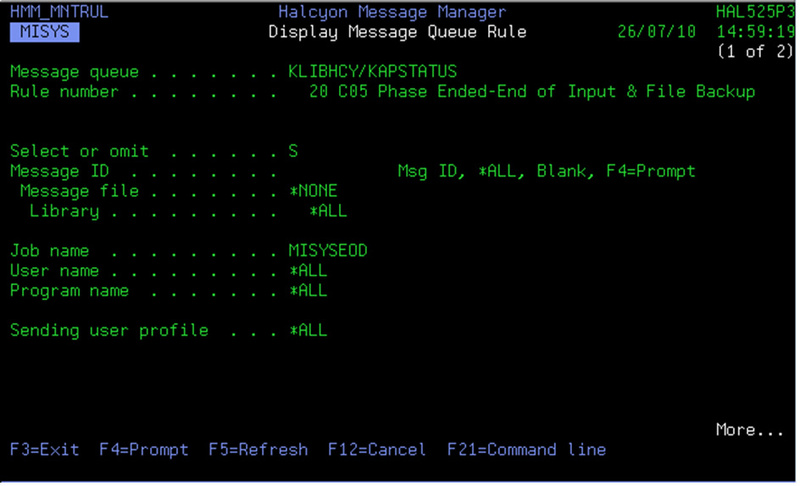 Message Manager allows you to monitor any user, system, application message queue (plus the QHST history log) for messages arriving and more powerfully not arriving. It also provides an inbuilt facility for monitoring FTP activity on the system providing the capability of tracking critical objects and / or user profiles.